Film of 23rd and 30th of October Transition Regional Networks where next meetings. On the 23rd and 30th of October we held tow meetings looking at the possible way forward for the Regional Networks project, we recorded these discussions which you can watch below., notes of the meetings are below the films, if you do not want to watch them. The meetings presented the findings we collated from the regional networks workshop, focusing on what has helped transition groups to thrive and what are the barriers towards doing Transition, then there was a discussion about the ideas for taking the project forward by considering how to further support regional networks and the development of a caretaker group to investigate the idea of a national hub for England and/or Wales. Most people have attended one of the regional workshops in England. Transition Network now coming towards the end of the current funded project on regional networks. This meeting is one of the meetings to look at what more we can do in the future. To consolidate and help regional networks to thrive? And is there an appetite to organise something at an England or England & Wales level? Mike Thomas - Transition Network - been running the regional networks project with Richard Couldrey over last 2 years. Nick Drew - West Kirkby and Liverpool - attended Lancaster workshop. Feels a long time ago! Mapping process to check Transition initiatives in the UK. From 400 once registered, now confirmed as 260 Transition groups in the UK. Analysed groupings and density to sense where regional workshops should be. Places “missed” were North East and Wales. (Scotland has its own Transition Hub). Wales has strong networking through the Renew Wales organisation. North East relatively less concentration of Transition groups. Initially planned to do 4 workshops so doing 10 was good. Through the workshops 91 participants from 65 Transition initiatives. (Not including the initial London workshop). At workshops - explored ideas of regional networking, whether that would be valuable to people. Did sharing of what was going on. Looked at what helped groups to thrive and what the barriers are. Then looked at what the roles and themes of a regional network might be. What helps Transition groups to thrive: In priority order! Staying connected: geography is an issue! The travel needed, dictates how much people can meet face-to-face. How can you stay connected when its not face-to-face - eg facebook, through technology. How do we diversify the voices around the table? The idea of a network manager/ co-ordinator - to hold the space, nudge things along. Could be a paid role, though some people are not comfortable with that idea. Created a comprehensive view of a regional network. Should it be “the same” all around the country. Sharing and support might be the only thing you can do as a regional network, in a context of volunteer time. Hilary Jennings - quite amazing to hear all the feedback and themes. Whether you need someone co-ordinating or moving things along - we wouldn’t be here in this discussion tonight without having had people working on co-ordination and pushing things along. Milly Carmichael - Interested to know more about how often permaculture came up (or didn’t) as Transition is rooted in permaculture. Lots of people involved in Marlborough Transition had not had knowledge of permaculture - now they’ve done a permaculture training course, now the plans and vision of the group are changed and different. So the permaculture theme feels important. Mike Thomas - permaculture came up a “bit”. A holistic, systems view and approach also came up, the idea of shared values. Maybe many people don’t realise that Transition is rooted in permaculture ethics and values, that wider systemic view. Richard - depended on the people in the room, most people are involved in many things. Permaculture involvement was stronger at the Leicester, Exeter and Cornwall workshops. John Waters - alternative technology movement - many years ago, wondered whether permaculture was a branch of alternative technology or vice versa. Ditto with Transition and Slow Food movements etc! Can be an unfortunate tribalism. Fundamental values of People Care, Earth Care, Fair Shares can resonate across divides and labels. In Chepstow John is trying to suggest that Transition group can bring people together, be a good partner. Adrian Toole - can relate to the reports from the workshop. Recognise all the themes as relevant to us. Would be happy to join in a geographically-constrained network which meant that meeting face-to-face would be possible regularly - eg the Exeter region. Tony Webster - in terms of shared values, “peak oil” as a driver seems to have gone off the agenda. Is Transition still committed to the idea of peak oil? Mike - Climate change was mentioned much more than peak oil. At Transition Network we looked at what the “Transition Story” is now, consider that it is about communities reimagining how their communities function, how they can become better. Initially, many people got involved in Transition because of peak oil, but now people’s motivations are much wider. Richard - felt common at the workshops to have a “keeper of the peak oil” as a motivating story, but there was quite a diversity of motivations - food banks, air quality etc. Tony - that resonates, our groups’ founders were inspired by the peak oil narrative, and now it seems we are talking about community economic development, community resilience. Joe Duggan - London and South East is an interesting example - the guinea pig that has moved on a bit. Our wishlist has now moved on into reality. Interesting to see what really works, what you can really do with limited capacity. Rob Simpson - didn’t hear much about resilience from the workshops? Have a “doughnut” situation with the core group of the Farnham Transition initiative. Chris Haynes - trying to think of the roles of a regional network - one issue is, what would be what is the narrative that justifies Transition? This narrative isn’t really easy, needs to be shared and broadcast and tested. Can the regional network play a role in the propagation of this shared story? Richard Couldrey: Idea of a shared story did come up in a number of the workshops. Some Transition initiatives have changed their name to “Sustainable X-town”. How can we be more nimble with narrative? Mike Thomas - can always base the narrative of the group on the local needs and culture. This is an important topic - an international group is meeting on this subject. Feels like there is some energy around regional networks, but still some development needed. We started this project with Joseph Rowntree Charitable Trust, was because Transition Network is acting as the Transition Hub for England and Wales - whereas now Transition Network is focusing internationally on the whole movement. We want to create an environment for a Hub to emerge within England and Wales. (just as there are Transition Hubs in many other countries). However initial conversations about this in England showed that people were more interested in meeting and networking regionally, at least to start with. Can we set up a caretaker group to help an England Hub to emerge? Consolidating and supporting regional networks? Are there things we can do to support each regional network? - for example, further meetings, activities, support, capacity, development, maybe a specific piece of work. Should we fundraise for a pot of money to help regional networks, relating to their own priorities? Wanting to ask whether people think this is a good idea? Adrian Toole - agreeing - we heard earlier participants from 65 groups - 260 exists. What would be most useful in my area would be someone who can spend time on the telephone, talking to Transition groups, making and keeping contact. Hilary - would be great to have more Transition Training offered, would help revitalise that understanding of Transition. Rob Simpson - what we need is education, co-learning, sharing the knowledge of things that work. Need to be a little more savvy in the political sense. More feedback loops. Thematic groups, for example about energy? Richard Hellen - we shouldn’t be too prescriptive, we should be more enabling. In gloucestershire lots of organisations align in the same direction; need to fill the gaps, be part of the “weft”, think global act local. See how we can meld with Local Enterprise Partnerships, especially if they are beginning to recognise the idea of the circular economy. John Waters - we are in a continually changing system. I would advise against investing any financial resources in something set. Worth creating a more flexible and adaptable situation, without needing to worry about where the next money will come from. (eg local currency database, recently folded without finances). Nick Drew - Investing in infrastructure sounds really important. 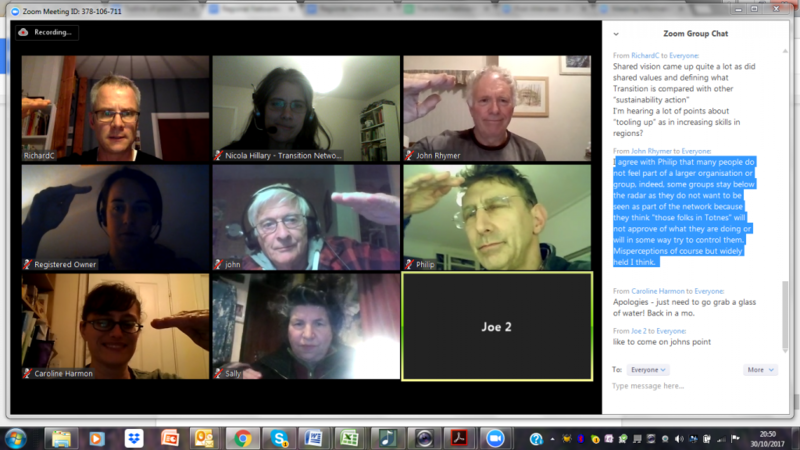 For example - this sort of Zoom meeting! Could do this in the North West. For example, to continue building up the trust. Its a slow process. Having a zoom account for regional networks. Joe Duggan - balance national level with micro-financing and local empowerment. Feedback loops and collective learning - people who have these skills of communicating Transition messages, lets access that. Setting up a Caretaker Group? Could a caretaker group for England (or England and Wales) look after the information coming out of the regional workshops, gently support the networks in the UK. Encourage people to come to a conversation, linking all the themes up? Develop governance practices? Connect with other organisations? What would be useful about a “nation” scale? Hilary Jennings - a caretaker group sounds invaluable. What it could do is hold the idea of an England/UK Transition conference. Otherwise there is unlikely to be another conference organised by Transition conference in England. Richard Couldrey - and that could be a way to continue face-to-face discussions. Richard Hellen - caretaker is a root word of curating. Could use the framing of the economic context into which we are moving. Eg artificial intelligence. Curate social enterprises, that work in the future context. Joe Duggan - really like the caretaker group in principle, want to know what other people think about it. Interested in being part of it. Milly Carmichael - thinking about the commitment required for people who are already doing voluntary work in their own communities, to then be involved in regional networks and then a national network. The more people are involved in all these levels, the less diversity there will be. Already this group meeting tonight is not very diverse. Mike Thomas - thinking about, if we put a funding bid in, how we could help people to engage if they are otherwise not able to engage - eg financial support, support for childcare etc. Richard Couldrey - I’ve put a lot of focus and energy in the regional scale over the last year. “Does that mean because I’m doing seed swaps and community garden AND regional networks AND…” - has to be some personal authorship about personal roles in life and what scale people prefer to work at. What does this mean for me. Need to look after the personal balances of people’s lives and capacities. Tony Webster - an England conference would be a powerful thing to do, in terms of hearing from different projects and ideas. Also a good idea is Massive Online Courses MOOC- excellent at broadcasting expertise and allowing people to share expertise. Needs someone to put that together. Transition Network has done online courses but not a MOOC. This Zoom thing is marvellous too! Adrian Toole - re funding - would hope that some of the funding could come directly back to the regional networks. Rob Simpson - Think Transition groups can act as a sort of space in their communities, regarding aligned groups. Eg a sustainability fair that pulled in lots of diverse groups. Transition groups can have this role to pull it all together. I would like us to go out, sell the caretaker group at quite a low level. In terms of MOOCs: Share Open Learning Environments - Newcastle University is useful. John Waters - Every single group or individual - the structures we develop won’t be unique to Transition. We need to develop structures that we can share with other groups. Like to be able to see synergy. Lots of potential and lots of potential mistakes - therefore I would like to be involved. Chris - will there be an objectives or metrics? Need these for funding applications? If we take the Caretaker Group idea forward we will email you with the opportunity to take part. Deadline for funding bid is early December, to hear April 2018. No guarantee of funding, but the idea of the caretaker group could still happen if there is energy for it. Would be helpful to have funding to help the process though. RC Lots to digest from this meeting. RH Has a colleague from Schumacher Institute writing a book on knowledge management for sustainability - this would be a great case study. I can see an emergent form here. JW I’ve got about two hours of things to add! RS Thanks for organising - loved the links to the maps. Will be interesting to see what next. MC Feeling grateful for the work leading up to this point. Lovely to be reminded of the picture from Bristol. Feeling hopeful and looking forward to helping Marlborough Transition be part of our regional network. TW Been very interesting. In terms of funding - some likelihood of not getting funding. Would be good to develop a plan B in case of not getting the funding! NH Taking the notes - I’ve missed all the action in the chat window! Have copied it below. Sally Owen, Transition and Low Carbon Communities Network in Powys, co-ordinator. We were also aware of the existing Powys network, so it will be interesting to hear Sally’s feedback from Wales. Actions seemed to come out of each workshop. Much information that Richard is now analysing, for his MSc and for this conversation about where we should next. Can a regional network help us increase our ability to be more effective in what we are doing? John Ingleby - Interesting review. Since April, we’ve been preoccupied with a project, this has now taken me back to April in Berkhamsted, we shared the film Tomorrow along with 2 other groups - was a great celebration, well attended. Something of a rhythm, sometimes work intensely locally, sometimes sit back and reflect. The local context has changed a lot in six months. Richard - yes, face to face contact was a big theme, but at the right amount/ rhythm, meet at the right time and the right time of year. John Rhymer - on Barriers - lack of time, capacity, lack of people and burnout - the same things under different headings. Really dominant and this is the experience among a number of local groups. In Worcestershire being in touch with each other really helped. We met twice a year, then kept in touch by email. So useful having met people face to face at least once. Then we could share a lot of ideas. 6 Transition groups in Worcestershire - and we have 6 repair cafes! One group had an Awards for All grant to help the other 5 groups get started, could only do that because the local network was in place. Hoping that a West Midlands network can multiply this effect up. Jenny Gellatly - Time and resources - this is so important, also in relation to Who gets involved. Something here around people’s capacity to participate, in terms of their financial capacity at different points in their lives. Reflecting on this in terms of a regional Hub or a UK Hub. Time and resources comes up really strongly. If there is a way of addressing that, this would be beneficial. Is there the idea to have people’s time, salaries in the funding application? Richard - need for financial resources wasn’t a key barrier noted or spoken about during most of the workshops. Sometimes there is kickback, from people wary of paying people in a situation with a lot of volunteers. Jenny Gellatly - can be salaries, but also resources in terms of events, time for people to come together. Not necessarily always just paid time! Sally Owen - Lottery funded network in Powys - done conferences and training - always comes up that people say they love to come together and meet face to face; meet people facing similar problems. The sharing is really appreciated. Powys is a very spread out county, so giving people a reason to get together is useful. Having a celebration each year is very important. Will try to continue that beyond their current funding. Caroline Harmon - agreeing with Jenny. Through my work I come into contact with lots of T groups in Derbyshire and most are primarily made up of retired people. The working people involved are the ones who tend to burn out or struggle to stay involved. Consolidating and supporting the emerging regional networks - what would that look like in practice? Thinking about the themes? What sort of things would help you at local and regional level? John Rhymer - can’t yet identify ahead of West Midlands workshop. Sharing software for doing this sort of Zoom meeting would be good. Facebook page. Help with setting up mailchimp groups? Help on this offered to each region. Funding to employ people might not be a universal need, things can tend to fall apart when that funding comes to an end. Also the lack of management of a local co-ordinator can sometimes be a problem, if they are left to flounder. So if we have the capacity to employ people, we need to give them the governance and management. Some of our experience is that people heavily involved in Transition projects - people have been able to set up social enterprises or small livings from these projects. Good luck to them, spawn a life of their own. Funding to initiate projects, possibly self-sustaining projects. Richard - resources for projects - shared projects did come up. What do we need to put in place to spawn any project that a regional network might want to take on? Jenny Gellatly - Strong desire from Transition Town Totnes to get together with the Devon and Somerset Transition groups, and to connect across the whole of the South West from Bristol downward; and particularly with Cornwall. The opportunity to do that would be very beneficial. Nicola - idea of seed-funding pot for regions - Good or Bad idea? Sally - seed funding pot idea sounds really good. Lottery funding has funded training - which has gone down really well. We would want funding to continue training in a relatively less-well-off area. Caroline Harmon - Transition groups can often do a lot with a small amount of money - so Yes. John Rhymer - everyone would welcome some seed-funding - needs of each region would be different. Some challenge in fundraising for it! Training can be generic for a funding application. If trainers can be paid directly to offer workshops in each region, every region would benefit. Also brilliant if we can get seed-funding that is free. Also - guidance to help Transition groups to fundraise, share resources to help Transition groups do fundraising, share help on bids. Jenny Gellatly - When people used to join Transition Town Totnes they would go on a 2-day training course. Haven’t done this for a while now. It would be really useful to be trained to deliver this training, so we can do this process again. Currently weak on our training and leaving process. Richard - Shared vision came up quite a lot as did shared values and defining what Transition is compared with other “sustainability action"
I’m hearing a lot of points about “tooling up” as in increasing skills in regions? Philip - as a recent joiner, very interesting. My group is full of very energetic people, very involved in particular projects. Surprised how little we feel part of a larger organisation/network. Can we spend money on some sort of communication that talks about what other groups are doing? Material easily available to each group that talks about what each group is doing. Also like idea of seed-funding. Joe Duggan - something here about how the Transition Network has moved to become an international body. Now a need to hear more about the Transition network in the UK. Richard Couldrey - idea of shared narrative and bigger picture came out in workshops, what story are we telling people. Also helping to join the dots - eg between groups who want to set up repair cafes - can we do this relatively simply? Also is there something about communicating to County Councils? John Rhymer - agree with Philip that many people do not feel part of a larger organisation or group, indeed, some groups stay below the radar as they do not want to be seen as part of the network because they think "those folks in Totnes" will not approve of what they are doing or will in some way try to control them. Misperceptions of course but widely held I think. Joe Duggan - if England had a grassroots led organisation that might help, and TN also wants this. There is a Transition Scotland, and has recently been a Transition Ireland. How do we hold this conversation at national scale. Thinking about a caretaker group. Taking care. International Hub scene - governance structures around the Hubs Group, this group has also raised 300,000 Euro funding bid on Municipalities in Transition. What we be worthwhile to explore at national scale? Should we hold that in a caretaker group? Is this caretaker group that could hold some of you, useful? Jenny Gellatly - lived in Spain, was in touch with the Spanish Transition Hub. Can really see the value of an England Transition Hub. Hear a lack of support that could be supplied by a Hub. People in Totnes… we have no idea what people are doing, because Transition Town Totnes is separate from TN. Would be so nice to hear more about what people are doing, to have contact with one another. More of a desire from Transition Town Totnes people for the national scale than for the regional scale. Richard - Why is Transition Town Totnes more drawn to national scale? Jenny - Different range of groups around the country, different sizes and durations of group, diversity of different groups at different stages. Would be richer at a national scale, potentially. Richard - some areas had more diversity in terms of “duration”: Cambridge workshop included someone really new; others with experience going back decades. John Ingleby - There must be a place for some bodies who can take an overview, say “here’s something that seems to work quite well” - share the story about it. If not, just random. Room for a caretaker overview, eg recommending repair cafes. Build up the story about it. So, in some countries Transition has taken off - what made it take off? Extract the juice and talk about it. John Rhymer - agree. Would be really nice to work out “what makes it work” for some transition groups or countries. Also, Transition groups go up and down. Important to say that sometimes it's just worth hanging in there through the low times, hear stories about how things have been made better after challenge. John Rhymer - not sure whether regional or national is the most helpful scale. But if someone starts this conversation nationally that might help. Not enough resources to save the planet! So maybe hold the conversation nationally, and when regional networks can take it up, that’s good. Richard - hold the conversations between national and regional scale, allow it to find its balance? Joe Duggan - How do these Transition Hubs work and what can we learned from them? The London and South East England Transition Hubs has a small amount of funding to hold online training workshops with some other Transition Hubs, to learn from them. Joe and Richard can feedback from this - or even do this in a way that people can listen in. Caretaker group to look after a national scale? Sally - I think England AND Wales. Quite a lot of crossborder crossover - quite close to Hereford. Some of our groups work on both sides of the border. Don’t think that Wales has enough energy to hold its own Hub. Transport wise, Wales is very split; and where I live there are lots of links to England. Could be a “borders” view though! Joe - interesting the relationship between a caretaker group and the regional structures developing… Wales could be a region and also part of an England and Wales caretaker group. Richard - offering to send a doodle for a potential caretaker group. A few thumbs up. The Zoom platform, from last week's conversation, we are now going to allocate some of the current JRCT grant to pay for a Zoom account for the next 2 years for England and Wales use. Nicola - now has to write a funding application. End November deadline - will hear next March. Hope to find a way that people can see a draft as it develops, on google docs? Joe - Richard will share email addresses. Nicola - thanks for the wise and rich contributions. Thank you Richard for the powerpoint presentation! Philip - very interesting, had a very strong sense that some really good ideas about spreading good practice, in a way that people want involvement with, exciting to see what will come of it that mean we will take a step forward. Caroline Harmon - main thing is the sense that Transition Loughborough isn’t alone. Looking forward to journaling and going to sleep. Richard Couldrey - fantastic chatting and seeing you in a good online space. Feel a deep sense of care for this conversation. Excited to continue going through the information from the regional workshops. Detail is so rich in the conversations. Would also like to write some blogs about it too in the New Year. Sally - Really impressive Zoom platform, because my broadband is pathetic but its still working really well. Looking forward to retiring next year and having more time to do all this stuff, without being paid and feeding back to the funders!